On Easter Saturday we dragged the teenagers out of bed early to ensure we had plenty of time to complete our day walk to Mt Wills. I don’t think anyone was sick in the cars, but the road up to the Tallangatta ski club was very windy. We left most of the party there to have a look around and a read in the sun, while Greg, Bruce and I did a car shuffle, leaving one car at Sunnyside where the Alpine walking trail crosses the Omeo Highway. Our pathway up from the ski club was on an old 4WD track through snow gums and beautiful grassy plains. It was a very pleasant way to climb Mt Wills. At the top was a telecommunications tower and a hut for use by walkers and skiers. The hut is situated in a pretty alpine meadow with rocky outcrops nearby providing extensive views all around. It was a great spot for lunch. We continued on the Alpine Walking Track, undulating along in the snow gums to Mt Wills South. Some areas had been burnt and the snow gums were growing back thickly, but the track was clear and wide as we began our steep descent. This was very fortunate, because once we reached lower altitude the scrub on either side of the track was laced with blackberries. Although they were rather delicious to eat, it is such a shame that their vines make so much of our native bush impenetrable. We made good progress and finished the walk with plenty of time to reverse the car shuffle, return to Mitta Mitta and enjoy a cold but refreshing swim in the river before dinner. A very enjoyable weekend was spent at Walwa at the caravan park alongside the Murray River. The weather was perfect being in the low 20s and just right for a walk up Pine Mountain. The track in created some excitement as there was a tree across the road and we had to dodge around on a pretty treacherous path. There were five walkers in total and we set off at a brisk pace to Rocky Nob where we had a taste of the beautiful views to come. From there the walk became harder with some serious climbs and rugged rock faces to scramble up. The landscape changed from bushy undergrowth, tall trees, and rock escarpments and at the top of each rise wonderful views. The climb was advertised as a seven and half hour return trip and it took us every bit of that including stops along the way to munch snacks and enjoy the views. A sense of achievement was felt as we reached the summit although unfortunately the view was blocked by trees. Some of the younger members of the group scrambled up to the cairn while the two senior walkers preferred to enjoy that vicariously. The trip down was very difficult in places but we all managed to negotiate the rocks and undergrowth to arrive safely at the cars. This was my first trip with the club and I appreciated the expertise and at times patience of Greg and Jill. Thanks for organising a great day. A stormy weather forecast did not diminish the determination of the Shepparton Adventure Club mid week walkers with three vehicles loaded with hardy folk, their rain gear and day packs. Endorsing the popularity of SAC walks in the Strathbogie Ranges, fourteen members were keen to again visit this strikingly beautiful region that forms the headwaters of Hughes Creek, a Goulburn River tributary. Our trip leader Howard had arranged for local identities and landholders Justus and Neil to be our walk guides for the day meeting the group at the former Ruffy Primary School for a welcoming morning tea. Our group was also joined by two local ladies keen for adventure with us. Being long term residents and Strathbogie devotees, Justus and Neil shared their local knowledge of current goings on and history of this spectacular yet little known area of central Victoria with passion and enthusiasm. Our walk took us from Donovans Lane across lush paddocks past interested cattle and down along Hughes Creek for a few kilometres to our lunch spot on a large granite platform deep in a secluded part of the valley. Light drizzle threatened for a few moments, however the storm threat quickly passed to reveal clear skies which remained for the rest of the day. A creek crossing on fallen log 'bridges' gave some walkers a couple of nervous moments. This provided the rest of the watching group entertainment waiting for a slip into the cold clear waters, they were disappointed as all remained smiling and dry. Following our creek crossing adventure the group split into two parties, one group following the small meandering creek along the valley floor, while a larger group climbed high up to the ridge line. Those in the valley experienced some exciting and wet creek crossings. The group who climbed to the ridge were rewarded with spectacular views across the region from the granite outcrops. Our SAC walkers and our friendly guides met in the valley end near Tarcombe to conclude the hike, with all agreeing that we had experienced a very enjoyable day. All vowed to return. The Shepparton Adventure Club would like to thank our guides, Ruffians Justus and Neil for dedicating their day to our group and the private landholders who allowed our walkers access to this beautiful part of Victoria. Thanks to Howard for arranging another succesful Ruffy Ramble. Forty-two degree heat. Sounded like the perfect day to go swimming all day, splashing each other while paddling along and just enjoying the scenery from the vantage point of our kayaks. Well, it was a perfect day, but not for the swimming part. The water was frigid! They must have let it out of the depths of Antarctica, not just the bottom of Lake Eildon! Those who were brave enough put their feet in, or went in up to the waist, and then quickly jumped out. It certainly took the bite out of the heat. The day went well with lots of chatter and no mishaps as we kayaked along from Alexandra to Molesworth. The day was enjoyed by all. There were a few new members who came, along with some regulars. Richard enjoyed trying out the new kayak; Bonny and I had a bit of an adrenalin rush as we went under the willows, but made it out after bumping into a few branches. We cruised into Molesworth caravan park. Richard looked like he wanted to paddle further, but he did pull in at the last moment, and we all got ready for the trip back to Shepp. The second trip, a month later, was as different in temperature as you could get for two summer trips. Jumpers necessary at breaks, but I neglected to put any in my bag for the day. Sufficed with my picnic blanket wrapped around me at lunch time. The others were a little wiser, with some warmer layers. However once again the company was lovely and the next section of the river from Molesworth was delightful with a few exciting spots where the water rushed over rocks or logs. Bonny was honing her steering skills and Richard did a great job remaining upright in his borrowed kayak which was not all that stable. After many bends in the river (Richard's map showed just how many there were...) and the many nice picnic sites we saw along the way, we made it to Ghin-Ghin bridge near Yea. Another successful day with a group of friendly people. We set out with 10 members (and one dog) of the Club to walk part of the trail that is a memorial to Jodie Ridges, a young mother of four whom, on her bike, collided with a motor vehicle and later died from her tragic injuries. The Jodie Ridges Adventure Trail Ride is a scenic bike trail between Victoria Park Lake in Shepparton and Cussen Park in Tatura. The start of our walk was at the end of Pyke Road, across the railway line where it enters the Mooroopna Common Bushland. About 5.5km to Mooroopna was on dried out, uneven bush tracks with potholes, some puddles and a couple of steep banks. The weather was glorious and lush green grass and plenty of flowering wattles made it feel just great to be outside. A mob of kangaroos avoided us and white cockies and rosellas were the only birds I can remember by name as our regular bird connoisseurs were this time not part of the walking group. Close to Mooroopna we crossed a muddy creek bed by stepping on some rocks and then crossed under the railway line where the photo was taken. We ended up at the back of the Mooroopna Silos and continued to the coffee shop for a break. Chatting non-stop all the way in small groups. It was good to feel the legs and knees and at the end of the 11km up and back track, reminding us that it's good to challenge ourselves a bit now and then so the muscles don't get too dormant. We do a Midweek walk every 4th Wednesday of the month, see the Activities link. “Aaaahhh, man that’s freezing!” I yelped as the icy water soaked into my shoes. We had come to the first river crossing we would be going through that day. Our big, heavy packs made it a bit hard to balance at first but the farther we got the more we got used to it. Also the rocks were slippery with slime so that made it even harder. After we’d all gotten through the first one we started walking again. The feeling of water in your shoes was interesting, it kind of felt like a massage. My uncle’s hiking boots were dribbling bubbly water out the back which looked rather funny. You could also hear a chorus of squelching as we trudged through the bush to the next river crossing. During some parts of the walk the bush was so thick that if you were too close to the person in front of you, you would get wacked in the face by a branch. In what felt like no time at all we were at the last river crossing. We stopped for lunch and, while eating, my uncle spotted a leech on his leg. I was horrified. I have a phobia of leeches and was promised there were going to be none. I started checking myself for them and got onto a rock in the water where I thought leeches would not be able to get to. Luckily there were none on me but I couldn’t calm down because I knew they were still out there waiting to latch onto some unsuspecting hiker. For the rest of the walk I tried very hard to stay on the track and not touch the bushes. Finally we got to the little creek that ran into the river, right before the beautiful, wooden Ritchies Hut and grassy campsite. I felt relieved to stop and rest, but scared of what I might find inside my shoes. With my heart in my throat I pulled off my shoes and was incredibly relieved to find no leeches. We were the first to arrive so we got the best spots to pitch our tents. It was still way before dinner time and we had brought an air mattress to try liloing down the river. We found a perfect stretch where you could float without getting stuck so my mum, setting the fashion trend, went down first in her boots and bathers. Soon it was my go. I hopped onto the mattress and immediately my whole chest froze! The water felt like I was in a bath of ice. But I didn’t have time to think about being cold because I was already at a little rapid. I got momentarily stuck but was pushed on by the current. I kept going but my steering was so bad I ended up spinning around so I was facing the way I had already come and went down the rest backwards. Even though it was freezing it was totally awesome. We also went down a bigger rapid that was really fast and exciting. Lots of people had arrived at the campsite while we were liloing so after dinner we all toasted marshmallows and ate chocolate around a campfire together. The next morning it was raining. Everything was soaked in water. All I could think about was that leeches like the wet and now it was wet, so that meant more leeches. I could just imagine them all over me, wriggling and getting fatter as they sucked the blood from my body. We decided we would go back the way we came because it was more exciting than the other track. So we set off back through the river twelve more times. I tried hard not to imagine leeches all over my bare legs but as we went I just stopped bothering because I was wet, muddy and all I wanted to do was get back to the cars. We kept squelching along and at the third last crossing someone finally went splash. Luckily Alice was the first and the last one to fall in. Soon we could see the cars through the bushes. The people that had been at the campsite the night before were there waiting already, having taken the easy track. We finally got to rest and put dry shoes on. It felt so good to have completed the walk and survived without getting bitten by any leeches. A group of five walkers met at the Library car park to carpool to the start of the day’s walk at Loch Garry. After quite a bit of discussion we decided to stick with the original plan of taking two cars, leaving one at the South East entrance and driving on in the other to the North East entrance, to start our walk from there. Loaded up with our lunch and morning tea provisions we walked along the water’s edge to the actual lock, where we stopped for a cup of tea. As we arrived at the lock a pair of wedge tailed eagles took off from the tree tops, spooking a big mob of pelicans, a smaller group of cormorants and a family group of lapwings into the air, flying up and down the billabong. Quite a bit of activity. Marg C was with us for her first walk and she is a very experienced “Birdo”, especially good at identifying the different birds by the calls she can hear. So we spent quite a bit of time looking for Peaceful Doves, Rainbow Bee Eaters, Red Browed Finches and Brown Tree Creepers amongst the more common birds in the area. Barb B remembered seeing a White Sea Eagle nest in the area many years ago and although we did see a big nest in the tree tops, we didn’t see the Sea Eagle. We walked on from the lock following the Northern bank of the billabong until we could head South, through the bush to find the track near the other arm of the ‘U’ shaped billabong. We then followed the track to the area of the Goulburn River, from which the lock fills when the river is in flood. We crossed over a couple of levies and sat by the river to eat our lunch. Still keeping a watchful eye out for anything that flew, we unsettled a Nankeen Night Heron from its perch on the river bank as we arrived. As we ate our lunch a silent Brown Snake swam across the river to our side. It was just downstream of us so we all very bravely maintained our composure and position. However, in the period until we began our last leg back to the park’s entrance I did notice quite a few backward glances, just scanning the ground between us and where the snake alighted. The last leg was completed in the mild shaded warmth of a summer’s day. We all agreed it was good to get out and walk a good number of kilometres on a very easy flat terrain. Thanks to Dianne for organizing the walk. We look forward to next month’s walk at Murrindindi Cascades. I type this from my bed of pain, having been soaked, battered, bruised, humiliated and sunburnt this morning on a canoe journey on my favourite river in the world – the mighty Goulburn River. Actually, it was fantastic. Peter (my brother and SAC lad) insisted upon my coming because the challenge of canoeing from Trawool to Seymour was really playing on his mind. As a veteran traveller of this beautiful river, I was the obvious choice to help him out (he is older and has difficulties with quite a few things). We began at the Trawool bridge where I was introduced to SAC members and friends –Richard, Maatje, Alfred, Dianne, Howard, Judith and Rachel (our very capable leader). Peter and I were awarded the green Canadian, which we promptly tipped over. Is this some sort of devious initiation, where the new chum is unceremoniously dumped fully into the river? At least the water was quite warm; unlike the time the dear Peter dropped me into same said river once in Spring at Alexandra, just after the gates had been opened at Eildon, affording me a snow fresh bath. After some severe adjustment of the seating arrangement in our canoe and handing my (now) destroyed mobile phone to my wife Deb, who had the good sense not to laugh (we do still live together), we set off with more determination than Captain Phillip into (almost) uncharted waters. But what a lovely river! Coolish weather, eagles, kingfishers, cockies (flying and farming), too many cows in the water and a light breeze made this journey closer to what Jerome K Jerome’s 3 men had in mind (no Montmorency, thank you). Morning tea and lunch was more a time of gloating that resting. Rachel pulled out her complete sized picnic rug and set up camp. I revealed the two largest vanilla slices with bright pink icing to accompany the brewed coffee, Judith opened up some Thai cuisine! We arrived at Seymour early in the afternoon, in time to watch some young lout hacking into one of the park trees with an axe. He was given a suitably arresting word of advice and subsequently sulked off into a corner somewhere. We loaded up the vehicles and went our ways, having had a top trip down Victoria’s premier waterway. Thanks Rachel for organizing this, and thanks all for allowing me to be there to help my brother. Chris, Maartje, Di & Howard arrived at Yarck early for a coffee. Mark, Anne, Josh & Tim met up with the crew to begin riding into a strong cold southerly wind. An easy 5km to Cathkin where some stopped to look at the old turntable. Then it was a left turn at the spur line to Alexandra and straight into the wind and upwards. There was a fabulous view out to the south from the top of the hill then a quick descent into Alexandra to the old Railway Station. Tim and Josh had a good look at the museum railway engines, then onto Alexandra for lunch. Returning the same way, it was a steep climb out of Alexandra then downhill with the wind behind us to Cathkin. Then just 5 km more back to Yarck, a total of 45km on Mark’s odometer – not quite so much on Anne’s (but that’s another story!). Another great bike ride organised by Chris. The Darby River Bridge was still undergoing repairs from the devastating floods of March 2011 as we passed by in the rain. Wilson’s Prom was severely damaged by over 370mm of rain falling in just one night back then and much of the park’s infrastructure was washed away. The road to Oberon Car Park and all the tracks leading from it are still closed, so the only way to access popular campsites at Sealer’s Cove and Refuge Cove is by walking all the way from Tidal River, around the southern end of the Prom (about a 5-6 day trip). This was a bit far, but suffering Prom withdrawal symptoms after not visiting for so long, we had decided to walk into and camp at Oberon Bay. So there we were, standing on the Picnic Bay Beach watching another storm race towards us over Norman Island, the sleeping giant in the sea. Greg, Lizzy, Moara, Cedric and I beat a hasty retreat back to the car before getting too wet and continued on to Tidal River to meet Kim, Alex, Emily and Guan. Fortunately the rain blew away, but we set up camp near the picnic shelter just in case it came back later. Tidal River had a deep pool for swimming near the pedestrian bridge, and some erosion of the banks near the day visitor’s car park, but otherwise looked familiar. Norman Beach was missing quite a bit of sand from the high tide area, but the sea was still clear with a beautiful small swell rolling in to shore. Cedric couldn’t wait for his first dip in the icy waters of Bass Strait. After our refreshing swim, we made good use of the hot showers and only the possum sleeping in the picnic shelter complained as the rain came down again while we cooked our dinner. Friday morning we awoke to a warm enveloping sea mist, thick enough to obscure any view of the hills or Islands surrounding us. It was quite surreal walking the length of Norman Beach in the still air, chasing the soldier crabs, but not being able to see more than a couple of hundred metres. The fog didn’t lift until we reached Growler Creek for lunch. There were multiple erosion gullies from the 2011 floods, which had washed away the track and a huge landslide which had come off Mt Oberon into the estuary of Growler Creek. We had been warned not to attempt Growler Creek at high tide and were expecting some fun getting across, but it turned out to be an anticlimax. The younger members of our party made a bridge of driftwood, so it wasn’t even necessary to take our boots off. Oberon Bay is a slightly smaller version of Norman Bay and in the still, calm afternoon it was a great place to try to teach Cedric the art of body surfing. Our campsite along Frasers Creek was very sheltered and we found fresh water a little further up using an existing track, but there was a lot of flotsam and jetsam in the estuary and entrance to the sea. Cedric, Lizzy, Greg and I explored up to the Southern end of Oberon Beach, where a creek coming off Mt Norgate had brought a huge pile of rocks down onto the beach. Unfortunately it rained again while we were cooking and eating tea. This didn’t stop the crazy Swiss guy from going for an evening swim afterwards. Greg, Lizzy and I were content to watch the rain water running down the beach to meet the sea. The wind was howling the next morning and we had to lean into it as we trudged back up the beach to Growler Creek. Fortunately the rain held off until we were nearly back at little Oberon Bay, but some in our party were keen to race ahead like horses bolting for home, so there was little time for stopping to enjoy the wild weather. It wasn’t so bad when we arrived back at Norman Beach so we stopped for an early lunch in a sheltered spot. After a second lunch (for some) of ice cream and chips at Tidal River, we decided to retreat from the predicted poor weather back to Melbourne. This shallow wetland is located down Wanganui Rd just on the north end of Shepparton off Reedy Swamp Rd and is a little known jewel for the city. We had the canoe trailer loaded with 5 canoes and the Noonan's joined us with their own for a very blustery late afternoon paddle. There is a little car park where we off loaded the canoes and carried them to the water's edge 20 meters away. Most of the water was only knee deep or less and there were many "breathing-in" moments to get over submerged logs. Richard C and a visitor Sandra learnt that it is impossible to steer the large Canadian canoes with only one good paddler in the back (and a kid in the front) with high winds as they were pushed to the edge of the swamp and struggled to get back! The rest of us managed to get up close to the nesting island of ibis and pelican. They were very protective of their half grown babies forming a vanguard in front and one did not get too close. It was an amazing sight of tens if not a hundred massive pelicans in the sky above us circling – like a busy airport! A friend did this paddle a week later on a calm day and commented that the pelicans were gorging themselves on carp which you could see under the water everywhere. I saw a brown snake slither across the path when the last of the canoes had set off which disappeared in the grass and stayed out of sight when we came back. That was enough adventure for me! By Fiona C.
A total of four hardy souls braved the winter chill for the June Mid-week walk. Two club members and two guests met at the library car park and went on to prove quality not quantity makes for a happy team. The 12,833ha Heathcote-Graytown National Park was proclaimed with the passing of the Box- Ironbark Bill in October 2002. After driving down through Nagambie, we started the walk at the Mt Black quarry. The granite in this quarry was once a rock source for the Goulburn Weir and provided a sunny setting for the traditional morning coffee starter, Mt Black is the highest point in the area and proved a bit of challenge to walk up. We were richly rewarded at the summit with fabulous views cross the Goulburn plain to Waranga Basin shimmering in the morning sun, and across to the Dookie Hills and the Strathbogies to the east. A cross country descent from Mt Black took us through stunning groves of Grass Trees (Xanthorea). We then headed down the track to the Melville's Lookout road and made this our lunch stop. Melville's Lookout is a prominent ridge where Captain Melville reputably waited in ambush for miners during the gold rush. We were disappointed no gold-laden coaches or bullock trains wandered past as we nibbled on our sandwiches but did enjoy the picnic facilities and fantastic views across towards Graytown that are provided at this Lookout. A leisurely walk back to the car and tasty coffee back in Nagambie was a great way to conclude an enjoyable day. Thanks for the company to Iaan, Ross and Richard. Our family of 3 kids joined 4 others with kids on private property adjacent to State forest near Guildford (near Daylesford) for a long week end of camping and caravanning organized by Jill and Greg. The children ranged in age from 14 down to toddlers and it made those of us with older kids reminisce about the "hard old days" with young kids! Sitting around the camp fire was a popular spot at the end of the day but the days were full of walks on the property and ferreting for rabbits and archery. Jill was a patient teacher and most people had a go at hitting the target in the nice still conditions. The sun didn't make much of an appearance the whole week end but it did not rain and we managed to stay warm with plenty of layers and eating good food prepared in camp ovens (Robin's efforts smelled delicious) or over the coals of the fire or re-heating spag bol from home! 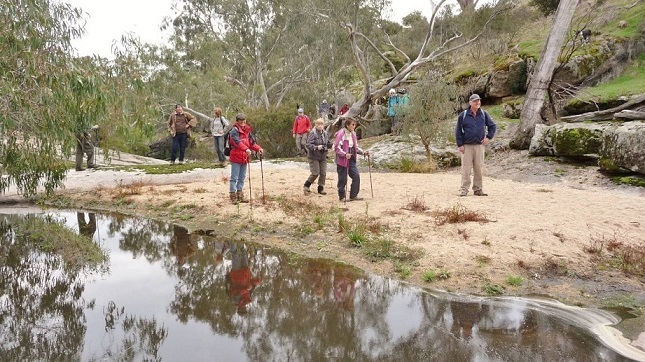 Seven children and 6 adults did a 7km section of the Goldfields Walk to Vaughan Springs. There were numerous old mine shafts with scary gaping holes which the kids loved to throw stones in to see how deep they were and remnants of old buildings/diggings along the way to explore. We shared the track with 2 horse riders, mountain bike riders and orienteerers but there was plenty of room for us all. The springs at the end had a high slide which kept the kids entertained while the cars were brought back and we sampled the carbonated water out of the well – YUK! I was amazed that I could be warm at night in near freezing conditions - so we could go away in winter again! Thanks to Jill and Greg for organizing a happy week end. It was a very early start for a Sunday. We meet at Len & Chris’s in Mooroopna around 8.15, a little bike organising and we were on our way. We travelled to Merton where we unloaded all the bikes. It was a chilly 4 deg with patches of thick fog especially around Lake Eildon. Then came the ‘Car Shuffle’ with Len & Mark driving the cars and trailers to Mansfield to meet with Chris H while the remaining group started out on their Rail trail ride. Leaving the cars and trailers at Mansfield we returned to Merton with Chris H to commence our ride. Our group consisted of Len, Howard, Chris H & Mark an extremely fit, focussed and competitive team set out to make up for the lost hour and reconnect with the main group. The fog had lifted revealing a beautiful sunny day with very little wind, ideal conditions. Rail trails are ideal places where you can ride safely and enjoy the scenery and the experience without the annoyance of traffic. We found the undulating hills a pleasant change from the flat landscape of the Goulburn Valley. And it’s not that we had any trouble navigating the trail but it was unanimously agreed that a few additional sign posts would be very handy! Hey guys!!! About an hour into our ride we reached Bonnie Doon where we meet the main group and gathered for lunch. It was great to see the high water level at the Bonnie Doon bridge. We set out after lunch for Mansfield at a leisurely pace, managed a few short stops along the way as well as learning a few bicycle tricks from Alice especially the ‘how to open the gate without stopping or even dismounting your bicycle’. Very clever indeed Alice! (for more details talk to Alice or her Mum) I think we all had a great day, many thanks to Chris H for organising the trip. Our November walk took on some new dimensions....historical and cultural as well as physical and ecological. Our first stop was the new Barmah National Park Heritage centre in Nathalia where the display was particularly interesting and the staff most helpful.... organising for the G.R.A.I.N Store art gallery to be opened especially for us, after our walk and giving us 2 for 1 coffee vouchers for the local bakery. We then followed the Broken Creek south side car trail to Barmah, noting the old bridges, weirs, remains of earlier thriving settlements of Narioka and Moira and evidence of old farming practices. At this point the tourism ended and we reverted to our raison d'être and set off on our walk. We started at the Darnya centre and headed south following the Broken Creek loop walk before crossing the Sand ridge Road, passing an aboriginal oven mound and onto the Lakes loop track. We lunched beside the Barmah Lake before meandering along the lake and then retracing our steps and heading back along the vehicular track to the Darnya Centre. The weather was magic and the abundance of birdlife, old trees and historical debris was a photographer's paradise as evidenced by some of the photos at our Christmas break up. Conversation went to what a truly wonderful place it was, so close to home and so ideal as a camping base for canoeing on the lakes and along the Broken Creek. Hopefully watch this space and something may eventuate for 2012. We took the direct route back to Nathalia for our mandatory coffee stop before keeping our appointment at the G.R.A.I.N Store. Chris thought we could stir the locals with our choice of partners for the coffee vouchers but eventually used his voucher quite discreetly!! The bakery proved to be another to add to our list of favoured places. Again Chris' skills were to the fore as he gently wound up the very exuberant and enthusiastic Veronica as she explained the amazing community art project based in the G.R.A.I.N Store. After browsing the impressive work of local artists in the current Barmah National Park exhibition, the eight of us headed back to Shepparton and Tatura, all agreeing it had had been a most enjoyable outing. If you haven't explored this area or have visitors we can recommend it as a really enjoyable day trip. Older trip reports can be found in the attachment below.